* Rafael Uzcategui is a member of the group that publishes the anarchist newspaper El Libertario in Caracas (Venezuela). As antimilitarist, he is also a member of the War Resisters� International and works in a Venezuelan human rights NGO called Provea. He is author of the books �Heart of Ink� and �Venezuela: Revolution as Spectacle� in which he reports the so-called Bolivarian process of Chavez and the true face of his �revolutionary� government. Taking advantage of his conference tour in Germany, we interviewed Rafael for the magazine Gai Dao. 1. Could you give a brief description of the anarchist movement in Venezuela? 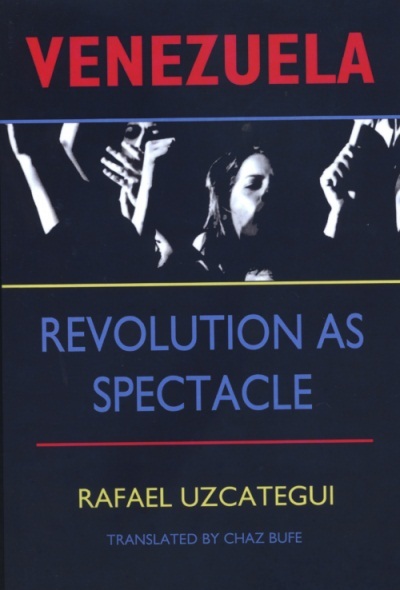 Rafael Uzc�tegui: In Venezuela the anarchist movement has never been so big and widespread as the anarchist movements in other countries in Latin America. It has always been small, because, among other things, in the golden years of anarcho-syndicalism in Latin America, the struggle for workers� rights was prohibited in Venezuela and most of the immigrants that helped to consolidate anarchosyndicalism went to other countries. In the early 80's there was a work linked to worker and student sectors greatly influenced by the ideas which came from the French May, that sort of scene changes of the left that came to Venezuela after that date. The precedents of what we are today took place in that time. In fact, the first newspaper El Libertario was a paper aimed at the working class and also handed out at universities. The anarchist movement in Venezuela gained in importance in the 90's, having a strong presence at major public universities in the country. In fact, there were two national meetings of anarchists. Somehow the anarchist movement was in tune with all the general movement of need for change which was throughout the country. The 90's was a decade with many demonstrations of students, workers, environmental movement, women�s movement, etc. against the implementation of the neoliberal package in Venezuela and, somehow, the anarchist movement was in tune with the social unrest, with that growth of social movement. However, in the late 90's after the victory of Hugo Chavez in Venezuela, the same thing to other social movements happened to the anarchist movement, ginving rise to stagnation, division, fragmentation � Let�s say the discourse of the new government in power confuses many people and that also affects paradoxically within the anarchist movement. We started the newspaper El Libertario in 1995 with the idea of making possible the realization of an anarchist federation in Venezuela, just after the two national meetings of anarchists. We had a view at that time that conditions were given for a national organization and that is why our group was called Comisi�n de Relaciones Anarquistas (Commission of Anarchist Relations) which tried somehow to connect people each other and establish organic links with the idea of establishing a future federation anarchist. After some time the groups in other cities were dissolved and the most consolidated group was the group in Caracas, which made the newspaper and more. Over the years we decided to solve this situation. We thought it was pretty hard to keep in mind the possibility of establishing a national organization and decided to forget the name of Commission of Anarchist Relations and continue only as editor group of El Libertario, because, that was actually the activity we were doing at that time. The anarchist movement in Venezuela today is a small movement. There are many different people and new collective initiatives in various parts of the country, especially in eastern Venezuela, but they are initiatives that are just beginning, more youth related issues such as animal liberation, perhaps inspired by the insurrectionalism and anarcho-punk, but still have no connection with real conflicts. At present it is a movement that is maturing, so to speak, but of course has different expressions, different people working in the country. Obviously we are not the only one and are not the authorized spokesperson of anarchism in Venezuela. We have our opinions, we are a very well-united affinity group, we do our work from the newspaper El Libertario and we are mainly linked to the situation of social movements to enhance their autonomy. More or less this is the anarchist situation in Venezuela. There ara elections for president this year and some anarchist organizations are just appearing calling to vote for Chavez. It is a bit strange this situation and a very rare coincidence. Of course, we have many suspicions of these groups that are growing doing propaganda this election year, saying that anarchism is calling to vote for Chavez. 2. The next question is required. Today it is impossible to refer to Venezuela without mentioning the so-called revolutionary process. What is the position that keeps El Libertario or the Venezuelan anarchist to the Chavez process? R.U. : We may summarize the main criticisms of the so-called Bolivarian process. First, for anarchists, the Bolivarian process is not a break with the past, but a continuation of the main historical political trends that have occurred in Venezuela, i.e. there is no break, but a continuum. The first clear continuity is that the project of President Chavez has deepened the oil-based economy in Venezuela, that is, the development model is still based on a primary model of mineral product exportation which has been the development model for Venezuela during the twentieth century. President Chavez has continued and deepened it in line with economic globalization. We think the world has been transformed. It is not the same situation experienced in Latin America during the Cold War and it is not the same situation in the 90's boom of neoliberalism. Now different Latin American states that have a lot of oil, gas, minerals, etc.. have managed to take back the offensive and they are using their regulatory capabilities, management capabilities, to attract foreign investments. It is a different situation in some Latin American countries to the status of offensive of neoliberalism. Now states have initiative. The states like Bolivia, Ecuador or Venezuela are which are attracting foreign investments, which are creating the conditions for global capitalism to have a better cash flow in our territories. This is the first criticism, which not only has to do with the questioning that all energy transnationals have now better business conditions than ever before, but a part of the criticism, because we are not claiming that the industry should be national, that should be a Venezuelan industry as a the typical request of the left. Our criticism goes much further. We believe that modern capitalism could not function without an economy based on oil and that it is needed to imagine a different development model than the extractive one, superseding the economy based on fossil fuels. This is a deeper criticism that not only has to do with the origin of capital operating in Venezuela. The second important questioning has to do with the conditions of everyday life in Venezuela. Although President Chavez, due to high oil prices, has got the highest revenues, the greatest economic boom of the last thirty years, in general what has been done with that money is not to attack the structural causes of poverty, but to implement a series of social policies that already existed in the past in Venezuela, which are palliatives for the society poverty and which are not structurally transforming it. On the other hand, Venezuela is a country where social violence has continued to increase. If government�s propaganda was true, which states that in Venezuela the poverty is coming to an end, it would be the only experience in the world where poverty reduction entails a violence increase. There is something that is not working in this equation and that has to do, from our point of view, with the structural causes of poverty which are still there: exclusion of large sectors of society, a very uneven distribution of gross domestic product, etc. This violence has taken over all dimensions of social life in Venezuela. In prisons, for example, with 50 thousand people in them, about 400 people die every year because of violence within prisons. In Venezuela there are on average 16 thousand homicides a year, reducing the quality of life of people. Right now there is no a public space, this has been privatized in the sense that meeting points are now the malls; people have closed themselves in private sites as their apartments, their homes, forgetting the space public as such. Obviously all cultural activities, including the political ones, have fallen for this reason and, in general, an impoverishment of the quality of life, people�s daily life, has taken place. The third criticism has to do with the situation of social movements in Venezuela. Since 1999, since his victory as president, Chavez has promoted the participation and the creation of new social movements. He has called his model leading role participative democracy. However, the participation of the people have very little bearing on decisions that really change their lives, i.e. this kind of participation makes people to build or to use the money to repair a school in a neighborhood, for example, but they are not allowed to decide whether the neighborhood is required to build that school or not, they can manage resources and ultimately hire people from the same community, i.e. logistics and management decisions. What they are doing is to participate in the implementation of state policies. They would be like the state earners, but without receiving salaries, who are executing the running work of the state. Besides participation is very limited, social organizations have been militarized and have mortgaged their autonomy to an elections agenda. There are elections every year and the most important thing is to win these elections; their own demands, their own agenda is for a future that never comes. Furthermore, it is promoted a political conflict based on the polarization, which we believe is false, that has caused that all networks that were active in the 90's (women�s and ecologist networks, those of students and others) and the movement that took Chavez to power have been neutralized. These are the three great criticism to the government of President Chavez that is for us part of the tradition of populist governments in Latin America, it is a way to manage the power that is characteristic of Latin American countries and that must be understood. It is not possible to analyze the Bolivarian process without understanding the history of Venezuela. It would be too narrow or too poor to analyze what has happened since 1999 until now without understanding that there are situations that have occurred in previous decades that have allowed this situation, without understanding that Venezuela nationalized its oil in the 70's, without understanding that democracy since 1958 has used oil revenues for social programs and policies, and without understanding that in Venezuela presidents has always been persons of a military nature, persons with strong characters as the military leaders. There is a tradition of military and messianic leaders and a strong leadership in the presidency. 3. At this juncture, what role do the anarchists play? What actually proposed the Venezuelan anarchists? R.U. : We believe that at this time is not possible, unless you want to form a sectarian organization, to promote the values upheld by anarchism. This does not promote a label, but values that must be lived in society, but these values defended and promoted by anarchism will not be spread in Venezuela if there is no space for autonomous and belligerent social movements. Of course we believe it is the collective action of people, that social movements are that transform society, not governments. Therefore, while that space does not exist, at least it is very weak (some organizations have a certain level of autonomy), anarchist values will not be developed, they will not be experienced by people who do not consider themselves anarchists. The grand strategy of us now is to work for the empowerment of social movements and that is why we, from an anarchist newspaper, are linked to all the organizations fighting against any of the powers that exist. In fact, it is not a discussion if people believe or not believe in Chavez, if they support him or not. If people are fighting for their rights and are facing the establishment, we are with them, promoting, participating, and trying to have influence on these struggles to boost libertarian values that have, to increase the values of autonomy. Of course, in the process of fighting with people, in the process of peer to peer support is that we can promote anarchist action. The major proposal of us now is that: the empowerment of social movements, the possibility to organize ourselves independently, horizontally, and trying to eliminate as far as possible hierarchies and authority, promoting social justice and freedom among other values. 4. Concerning this autonomy, which struggles would you consider at the moment to move in this direction? R.U. : On the labor aspect there is a platform that defends union autonomy values which is the FADESS ( Front in Defense of Employment, Wages and Union), because the government of President Chavez has an ongoing campaign against the independence of union, against union autonomy. This is a network of several union organizations, but within it there are also contradictions, because there are unionists who promote verticality, who want to try that this platform is more linked to opposition political parties. Right now there is this tension within this platform, but while there is a group fighting for the issue of union autonomy, we will continue to support them, participating in their meetings, going to their events and trying to influence for the issue of union autonomy, as we have done so far, to be more important than those who want a traditional trade unionism there. In Venezuela it is very difficult to talk about movements that are independent or not. Of course, there are movements that are not autonomous, but there are other movements that have certain levels of autonomy. No one hundred percent autonomous movements. A second movement has to do with autonomous power of the indigenous movement that has struggled in Venezuela in the past ten years. One of the most important struggles is the fight against coal mining in the State of Zulia. There are three indigenous ethnic groups that, due to government�s proposal to exploit more coal, due to the possibility that they have to be displaced and air, land and water pollution, have organized different struggles and different levels of mobilization. There are some levels of autonomy that we are promoting and that will always have a space in our newspaper. Another fight is performed by the popular committees of defense against impunity, especially in the State of Lara. There are several popular committees against police abuses in various parts of the country, but we think the most interesting, because it has a much more radical discourse, is the Committee of Victims Against Impunity in the State of Lara, which is a grassroots organization that have been working since 2004 and fighting against police abuses, against the violation of right to live by the police and against the involvement of police in various crimes, in addition to the corruption of the courts. I think that is the most interesting movement in recent years. The movement of gays, lesbians and transsexuals had a very interesting position for some years. They organized a separate rally, the gay pride march was independent. However, in recent years it is a march that has lost a lot of independence and is now a march organized by the governments of the city of Caracas. Important spaces of autonomy have been lost there and now it is a movement that is no longer interesting as before. 5. In your book �Venezuela: Revolution as Spectacle� you mention Chomsky regarding his position about Venezuela. Could you tell us about the relationship of Noam Chomsky and Chavez�s Venezuela? R.U. : Noam Chomsky is an American intellectual who has written many interesting things about anarchism, which is well known for his analysis of American foreign policy. However, in recent years Chomsky has shown great admiration for the government of President Chavez. He has only been once in Venezuela for 48 hours and only had meetings with government members and Chavez himself. His view is that any group or ideology which questions that U.S. hegemony is a good movement to him. It is basically a left-colonialist position from the United States. The analysis of Chomsky on Venezuela is based almost exclusively on reports and propaganda carried out by the government about its �achievements� and, of course, he has many mistakes, gaps and contradictions. For example, Chomsky states that for the first time in Venezuela health is free what is historically wrong. It is very easy to check that this is false. I do not mean that health was better then or now, what I am saying is that health has always been free in Venezuela due to the oil issue, and since 1958, at least, it is an obligation of the state. Chomsky also says, for example, that President Chavez nationalized Venezuela�s oil, what is also false. Oil was nationalized in 1975 and Chavez is actually taking steps backward with respect to such nationalization. So Chomsky is very badly informed about Venezuela. It has the typical academic intellectual vision of the United States. In fact, the book that I had the privilege to write was precisely written to try to refute the claims made by Noam Chomsky for the left, not only the U.S. left, but the international left, about the �revolutionary� process that is taking place in Venezuela. Unfortunately, it is not the first time Chomsky has that kind of opinion and analysis on countries in conflict with the United States. In the case of Cuba or in the case of Middle Eastern countries he has had the same view, a view very indulgent regarding any country that discursively faces the U.S. hegemony. 6. Any comments or messages you would like to emphasize to people in Germany? R.U. : Every time we have the possibility of being interviewed by foreign comrades or visiting countries and sharing our view about Venezuela, in the end what we say is �do not believe what we say�. We will not state that what we are saying is what is really happening in Venezuela, but we invite anyone, not just the anarchists, who are interested in the Venezuelan situation to see it by himself. Go to Venezuela if you can, talk to people on the street and try to compare as much information as possible to draw your own conclusions. Perhaps we can give people some information, some valuable information. We have a website (www.nodo50.org/ellibertario) with a section in several languages. Perhaps there are some texts that would be interesting for people and can give a different view about what is happening in Venezuela. We also invite people to look at the current situation of Latin America and see that the main conflicts that are occurring there at present are popular resistances against the rise of oil and energy extraction projects which are being paradoxically promoted by the self-called leftist governments. We invite you to make contact with anarchist organizations, to increase the exchange of information, relationships, etc. There are many groups in Latin America with which you could talk and learn about what is happening.